About 175 homes on the Isle of Man remain without power for a fourth day after heavy snow wreaked havoc with power lines on Friday. Manx Electricity Authority (MEA) said it was "the most widespread damage to power lines since the storms of 2005". About 700 houses were cut off after heavy snow fell on Friday. Since then over 500 homes have been reconnected. Five people were rescued from their homes over the weekend when they were stranded by snow drifts. According to the MEA, the "most vulnerable have been "prioritised". Supplies have been restored to Eairystane, Ronague, Laurel Bank, and Jurby Church overnight. Work is currently under way in the Curraghs and Stockfield Road at Cronk y Voddy. Ms Andrea Kneen, spokesperson for MEA, said it was estimated that Eairystane, Glen Helen and Jurby Church would have power restored by the morning, while Barregarrow, Sartfield and Fleshwick could take longer. Homes in Ballacallin Hotel to Lhag, remaining parts of Cronk-y-Voddy, Ballaholly to Ballcrye and Ballaugh Curraghs and areas of Abbeylands may have to wait over 72 hours to have supplies back on. She added that the company "apologises for the inconvenience" and recommended "customers who remain off supply continue to safeguard themselves". The MEA said that supplies to almost 99% of customers have been maintained. Isle of Man Police Sgt Rose Hawes said the force was attempting to provide assistance to "any vulnerable people". 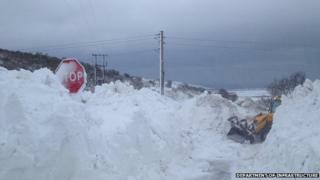 A number of roads on the island remain closed due to the weather. Insp Steve Maddocks said: "Emergency services and other agencies are continuing to deal with people and places affected by the severe weather conditions over various parts of the island. "Motorists are asked to utilise the main arterial routes around the Island." According to police Cronk-Y-Voddy, Baldwin and Dalby remain closed and impassable and these roads should not be used.